Gift cards are great last minute gifts and can easily be dressed up in fun and easy ways. 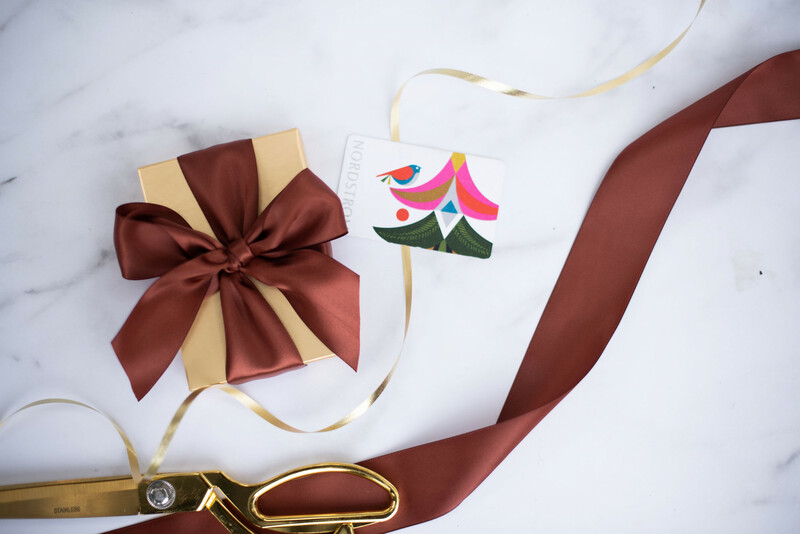 Today I am sharing my favorite gift card ideas and fun ways to give gift them. These are perfect for teachers, service workers, kids instructors/therapists, trainers, and so many more. Cute for stockings, too. And so many ship same-day on Amazon! Any girl would LOVE to receive a Drybar gift card. What a fun gift for someone who deserves to be pampered! When you purchase a gift card at the Drybar, they will give you one of their cute bags. 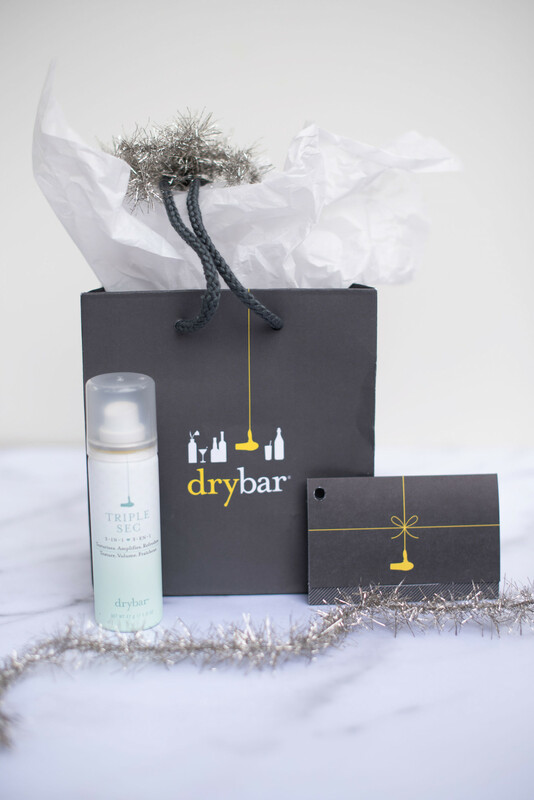 I picked up a travel size of my favorite Drybar product, their Triple Sec Texturizer, but it would also be fun to pair it with this ‘Drybar to Go Set.’ However, if you can’t go to the store, you can purchase and print Drybar gift cards online and pair with a travel brush or send via email. This would be a great gift to send to office staff, too. 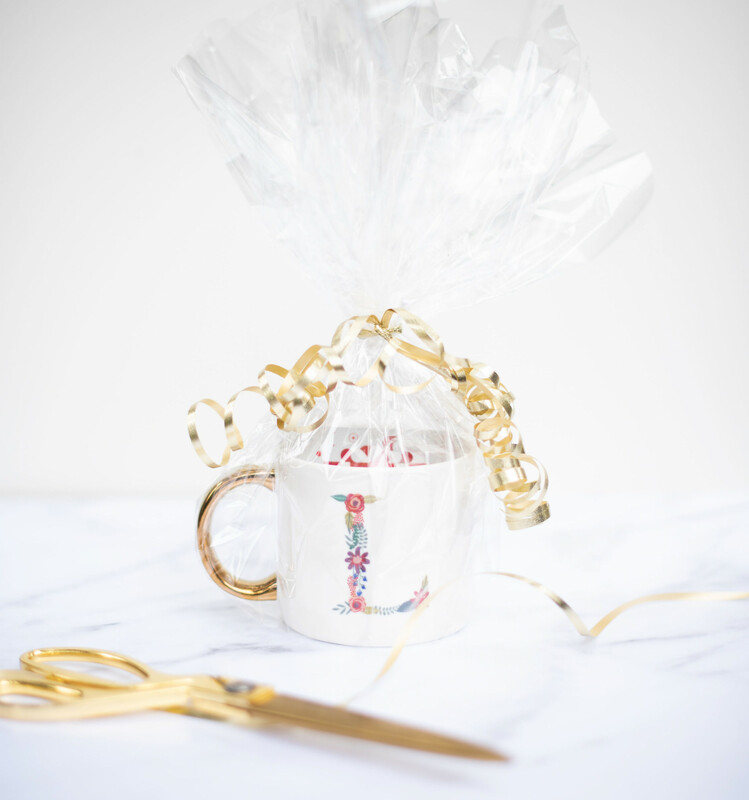 Pair a Target gift card with one of Target’s adorable $6 monogram letter mugs and wrap in a piece of clear wrap and candy to dress it up! Other ideas for gifting a Target gift card would be to pair it with a few fun items from the dollar section or some school supplies for a teacher. A Nordstrom gift card is definitely my gift card of choice because the recipient can always find something he or she wants! I wrapped this in a nice gold gift card box box from The Container Store. If you are looking to pair something with it, Charlotte Tilbury’s Pillow Talk lipliner or lipstick or a NEST candle would be perfect! 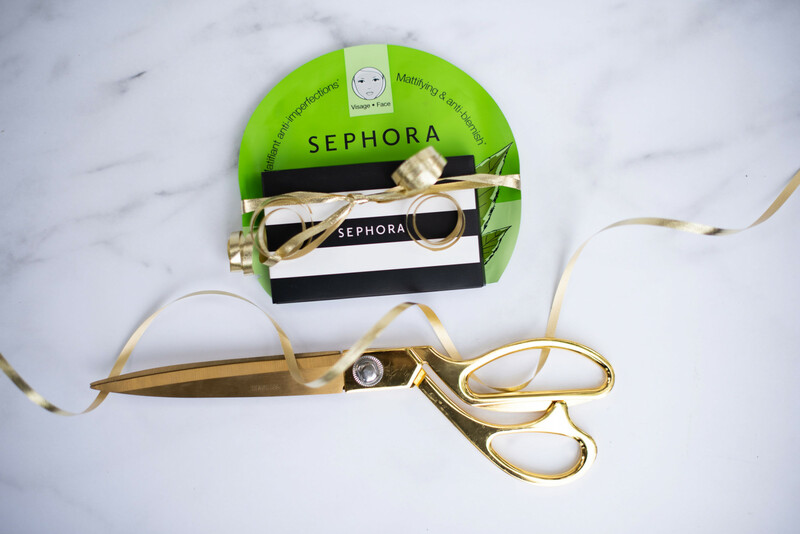 A Sephora gift card is perfect for your beauty loving friend and even better with a Sephora brand mask. No time? Order a Sephora gift card on Amazon and mask from your local drug store. I also recently discovered these little makeup remover packets that smell wonderful and make taking off makeup easy. Those would be another great little gift to pair with a Sephora gift card! 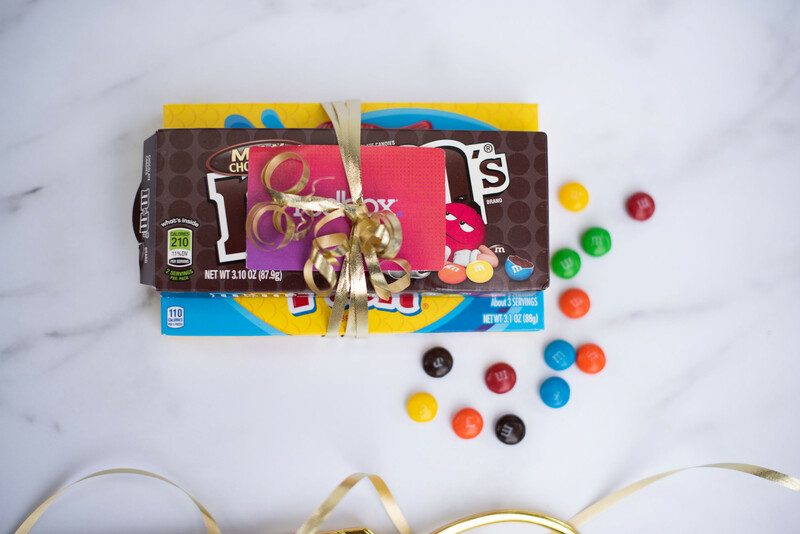 This is the easiest last minute teacher gift! Pair a printable Redbox gift card with some drug store candy or popcorn. Perfect for male teachers, too. Another easy gift card idea for men on your list is a Barnes and Noble or movie theater gift card on Amazon. Pair with a book or popcorn. Most party supply stores have little paper popcorn holders that you could fill with popcorn and candy, too. 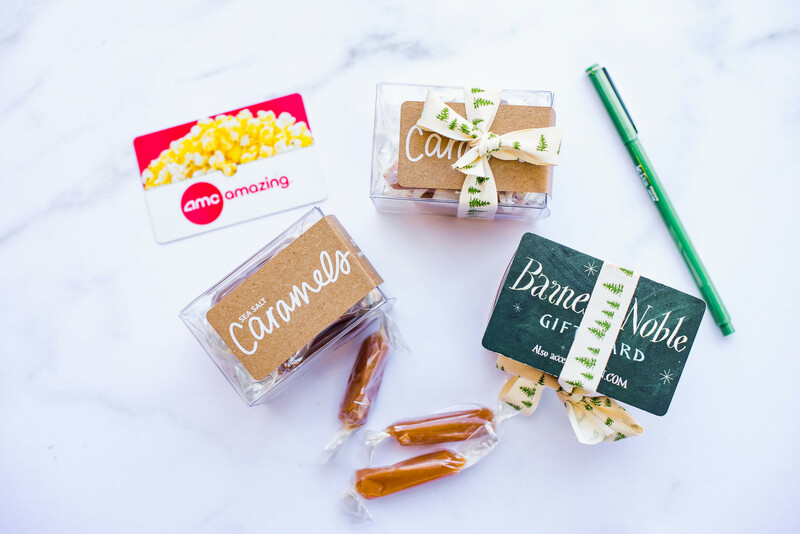 This year I paired several gift card gifts with Joy + Oliver caramels. Tip: You can find many of these on Amazon with same-day or 2-day shipping, even print at home gift cards, and Target offers 5% savings when you use your Redcard. Etsy has darling instant downloads to dress up lots of gift cards, too. Starbucks – Pair a Starbucks gift card (on Amazon!) with a coffee mug or sweet treat. Home Improvement Store – Write a little note on a paint swatch to gift with the gift card or maybe pairing it with a hammer or new gardening gloves. Find gift cards on Amazon. Email delivery an option as well. Chick-Fil-A – When you pick it up, ask for an empty nugget carton to wrap it in for a kitschy presentation. Chipotle – If you are looking for the perfect gift card for a college student, get this! Try wrapping it in one of their chip bags for a little something extra! Amazon – If you are absolutely stumped on what to get someone on your list, an Amazon gift card is definitely the solution because they truly have everything! You can order with prime or download and print – or email! Pinterest has darling printables to go with teacher gifts. iTunes – An iTunes gift card is a creative alternative to giving teacher apple-themed gift! Give with an apple;). Target is having a deal right now on Apple and itunes gift cards. Lululemon – Lululemon is a wardrobe staple for many women and Ivivva for girls! Pair a gift card with one of their headbands for a fun, much appreciated gift! 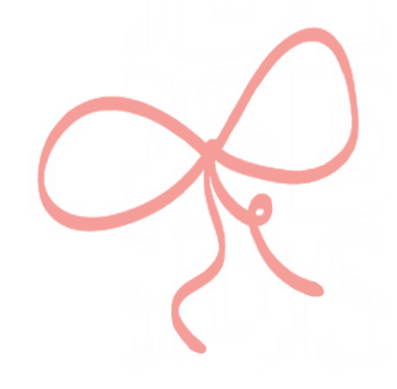 Cherry – Cherry is an on-call nail service in Dallas.As a mom of four, it makes getting my nails done much easier! Pair one of their gift cards with a bottle of nail polish. Southwest Gift Card – For the college student to book their spring break trip! Uber Gift Card – Perfect for college student! Pair with some breath mints or lipstick for girls! Local Cooking Class Gift Certificate – Pair with a gourmet food basket, mixing spoon, cookbook. In Dallas, Central Market offers great classes. Floral Arranging Class at Local Florist – Pair with nice garden tools or a floral arranging book. Art Museum Membership – Pair with these cute board books. Or sketchbooks and colored pencils for older children. Maybe even monogrammed tote bags to take their sketchbook to the museum. Audubon/Nature Center Membership – Pair with this game or bird guide for children. Or one of the many nature books on DoSayGive’s Holiday Gift Guide. Bounce House/Trampoline Park Drop-In Gift Card – Pair with cute socks! American Girl Lunch Date or Beauty Parlor Appointment – Pair with anything from American Girl! Books on Amazon. What creative gift card ideas do you have? Share below! 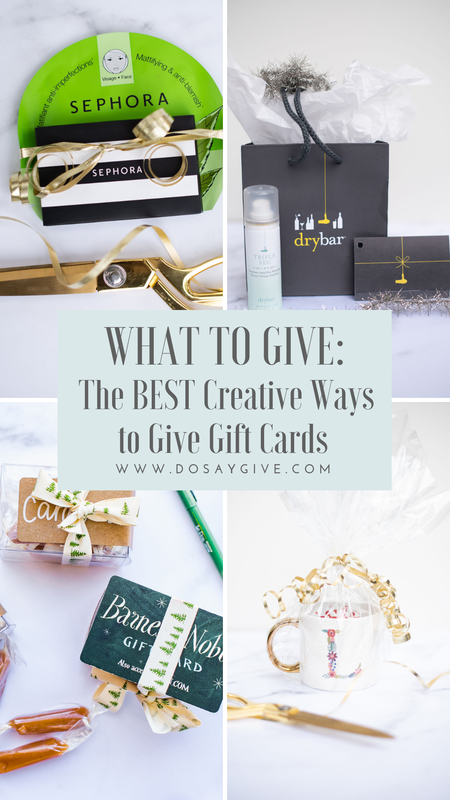 Browse more creative gift card ideas on this Pinterest board and make sure to pin this because most of these can be used year round! love these ideas!! Thank you Lee! Just wish I had them a tad bit earlier!